Lexmark Genesis S815 is an All-in-One printer that features something called Flash Scan technology that lets you scan a document in about 3 seconds, or so Lexmark claims. Let us hear what the tester over at at Trusted Reviews has to say about the S815 printer. Trusted Reviews ends up giving the Genesis S815 an overall score of 8 out of 10 possible points. The Lexmark printer scores highest on print speeds, print quality and features while it scores a little lower on value for your money. 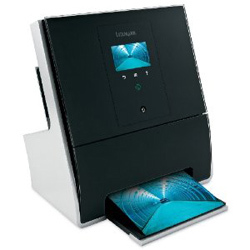 If you are looking for a vertical scanner the Lexmark Genesis S815 might be your choice, especially if you are looking to scan a large number of printed photos. Read the full review of the Lexmark Genesis S815 All-in-One printer here.